Resurgent Husqvarna have continued the build up to the launch of the new 701 Supermoto with this video of a spiked-tyre equipped bike on a frozen lake. 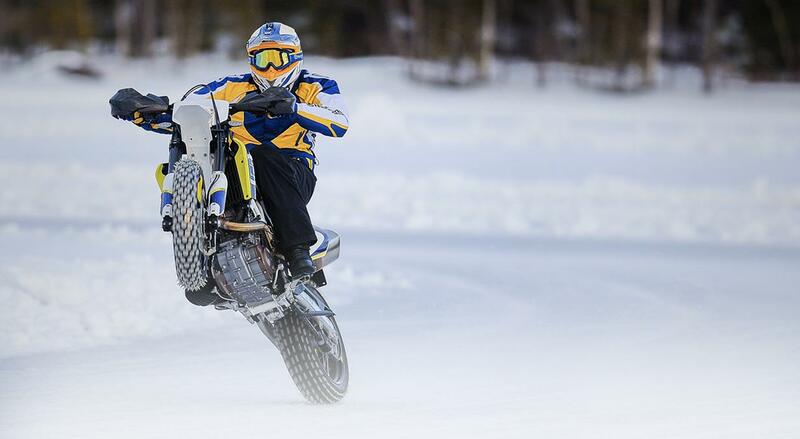 And if you visit the Husqvarna microsite you can be in with a chance of winning an ice riding experience in Sweden just like that seen in the video. While the video looks like great fun to have made it does also reveal what appears to be a completely finished production version of the 701 which, until now, has been seen in prototype form and in rough test bike form in spy shots. Husqvarna states: “Combining Swedish simplicity with outstanding agility the 701 Supermoto brings Husqvarna back to the streets for the first time in the iconic brand’s new era. A leader in terms of technology, the 701 Supermoto is driven by a powerful single-cylinder engine that offers thrilling performance. Its clean and uniquely modern design is perfectly matched to the bike’s lightweight construction, creating a pure, modern Supermoto machine that will get your adrenaline racing. The 701 Supermoto and Enduro versions are expected to be launched later this year.